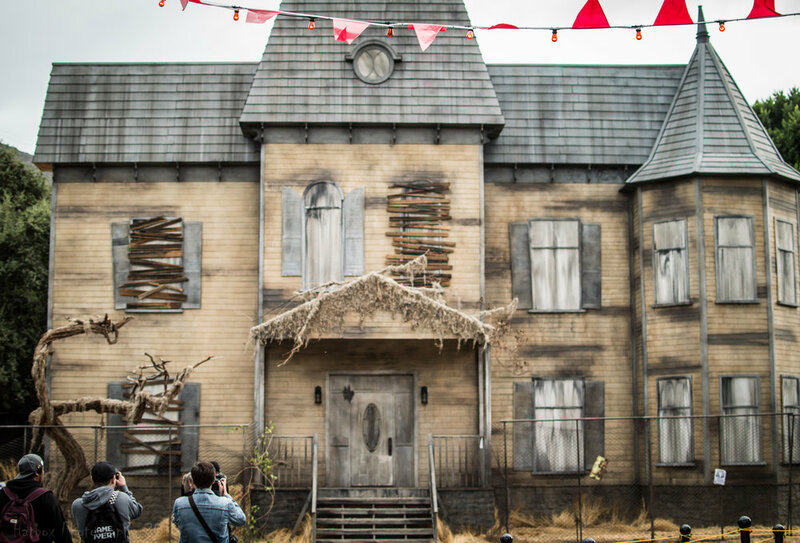 On Wednesday night, October 3rd, 2018, we were invited to the press event for Warner Bros. Studios Horror Made Here: A Festival of Frights. This was Warner Bros. 3rd year running the event but only the 2nd year that included mazes. Warner Bros. is very new to the Halloween game but based on what we saw Wednesday night, they are ready to play with the big bad boys of Halloween. This will be our complete and honest review of the event. Hope you enjoy. We arrived about an hour before the event and parking was super easy. There is an underground parking lot located at 3400 Warner Blvd, Burbank, CA with multiple levels that is just down the street from the backlot and the entrance to the event. We were instructed to park on levels 4 or 5 and as we got to level 5 there were parking attendants showing us where to park and directing us to the elevators. They were very helpful and friendly. Check in for the media event was smooth as was the trip through security and the shuttle ride to the entrance of the event. You are dropped off next to an old broken down carnival. There are photo opportunities, props and a giant banner welcoming you to the event. For the media event we were allowed to walk right in however we are unsure of how this will work on a normal evening. Here are some photos from the Carnival area. 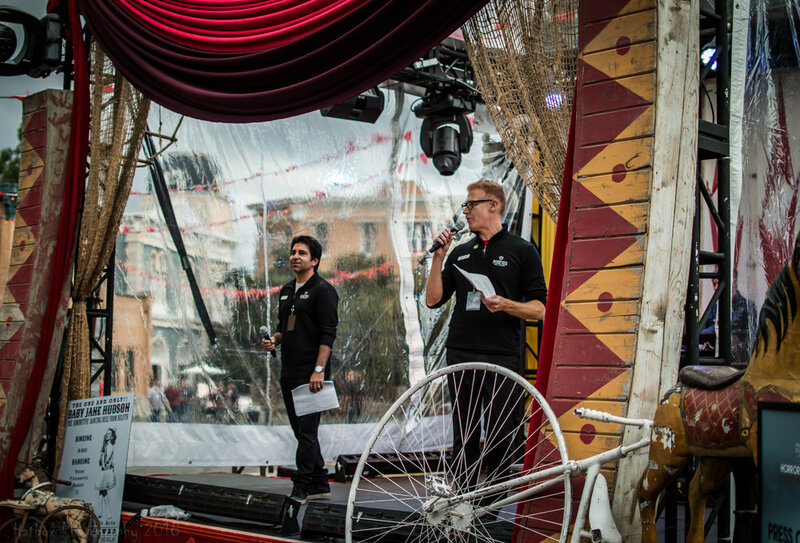 We had no idea what to expect when we walked into the event so we were a bit surprised to see how small the event was. This is not a bad thing, the space is just a lot smaller than we were used to with Knott’s, Universal or even Queen Mary. The main portion of the event takes place on part of the backlot of the Warner Bros. Studios. All 3 mazes are in close vicinity to each other as is the loading area for Nightmare on Camp Crystal Lake and the church that The Exorcist: Forbidden Screening takes place in. This is a nice change from all the other theme parks where you have to walk forever to get to a maze, show, etc. There is a bar called Fangtasia which is based on the bar from True Blood. There is a gift shop called Little Shop of Horrors, a Lost Boys arcade and a café. There are vendor carts selling treats such as pretzels, churros and sodas in several locations and a few other food stands that sell burgers, fries, corn dogs, etc. There are two restrooms on site, behind the church there are pop up restrooms which were really clean which is always a good thing, and then inside Stage 48: From Script to Scream. The only portion of the event that is in a different area is Nightmare on Camp Crystal Lake but that is a short cart ride to and from. Overall we really liked the layout of Horror Made Here. It was simple and easy to find things. We never got to see the IT Experience in Hollywood last year so we can’t compare this year to last, but just walking past the Neibolt House gave us a little bit of the creeps during the press event. Georgie was often seen standing on the porch or running after guests that dared to walk past the front of the house. It was a nice little touch to the outside of the maze. 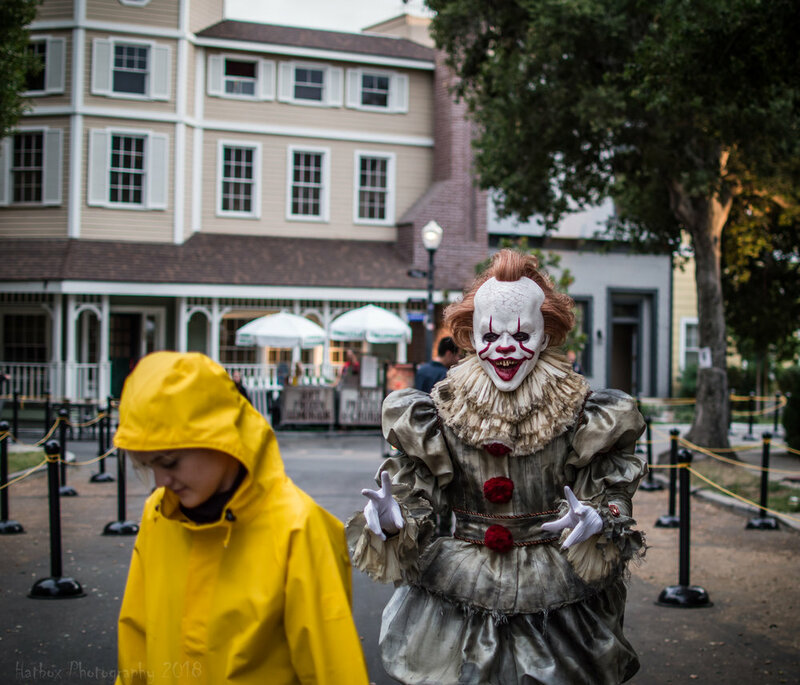 Once you enter, you are thrust deep into the IT movie with many iconic scenes recreated. The detail is stunning, the characters are energetic, fun and very interactive and the soundtrack is perfect. This was our favorite maze of the night and one of our favorite mazes of the season from any Halloween event we’ve attended so far. This is a definite must see this Halloween season. 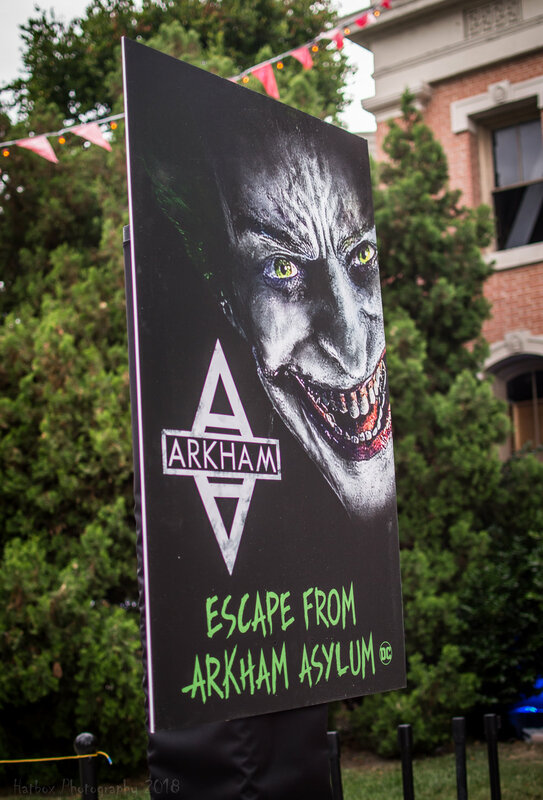 When Arkham Asylum was announced at Midsummer Scream (www.midsummerscream.org) back in July, it brought excitement and enthusiasm throughout the Grand Ballroom. It was one of the most anticipated mazes of the season. 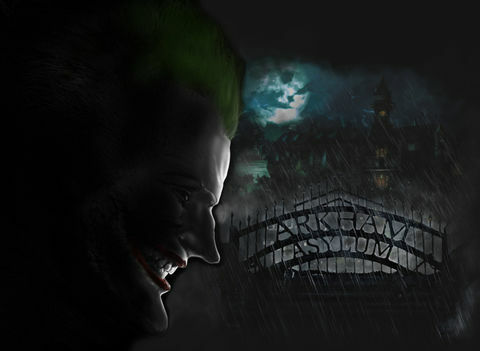 The video game Batman: Arkham Asylum is one of the most popular video games of all-time so if the maze lived up to the hype it would go down as one of the greatest debuts in Halloween history. That however was the problem with no fault of Warner Bros. There was so much hype that it would have been impossible to meet the expectations. Arkham Asylum is beautiful to look at, the detail is extraordinary and the cast of characters include Harley Quinn, Two-Face, The Scarecrow and of course the Joker. The Joker’s found throughout the maze are exceptional and really play the part well. In the end, we were still left wanting a little more story but that is as far as our complaint goes. Overall this is a very fun maze that is beautiful to look at and hopefully it returns next year with a story that flows just slightly better. Big shoutout to the cast of characters in this maze that played their parts perfectly. Especially the Judge Joker in the beginning. He was funny, witty, and sounded just like the Joker from the video game. He was fantastic. 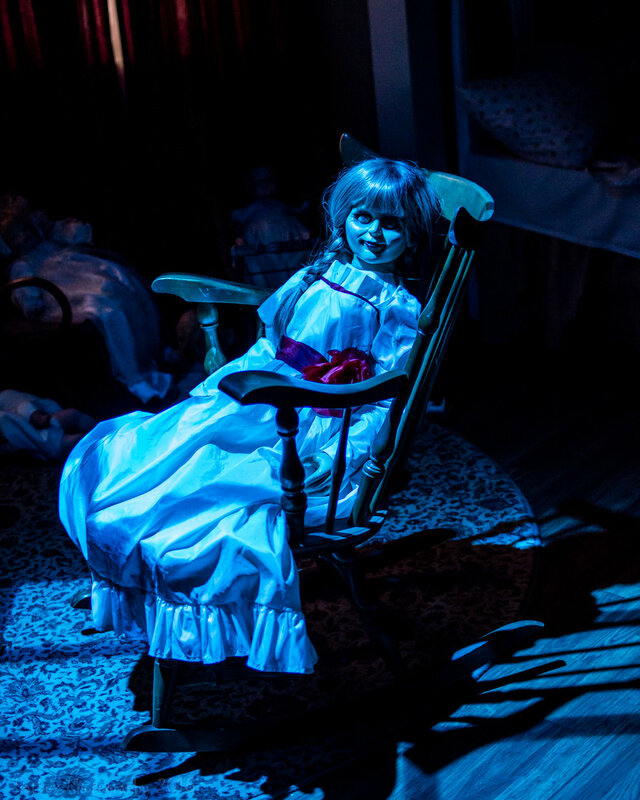 The Conjuring series is one of our favorite horror series of all-time (minus the prequel Annabelle) so we were excited to learn that the Universe was being brought to Horror Made Here in 2018. Some of the most iconic characters of horror’s new generation of films can be found throughout the Conjuring series. Annabelle, the Crooked Man, Valak the Nun. We were hoping to see a few of them in the maze and we weren’t disappointed. The maze begins as you make your way into a house and are held in a room at the bottom of some stairs. With you in the room are several mannequins covered with white sheets. As you wait for the door to open in front of you, heavy steps can be heard from above. Who or what is walking upstairs? A few in that room may find out, others will have to wait. Most of the maze follows this same premise, you move into a room and are held there while you encounter various characters before being instructed to move to the next room. You are not allowed to freely roam the maze like most mazes which makes this one fairly unique. It all builds to the finale which is worth the wait. Two very famous characters are waiting for you at the end. This maze does have a lower capacity due to the nature of the flow so we highly recommend hitting The Conjuring first before moving to IT Knows What Scares You and Arkham Asylum. 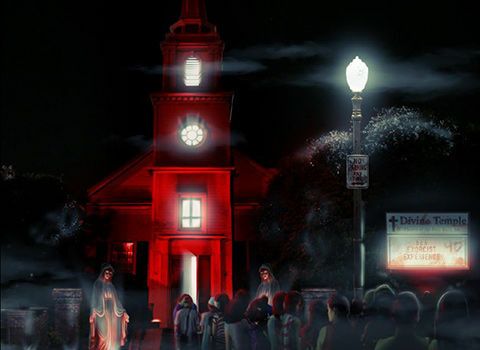 The Exorcist Forbidden Screening takes place inside an old church on the Warner Bros. backlot that has been in films such as The Lost Boys among many others. It is an 8 minute journey through the film with various clips strung together with a few surprises along the way. It is a fun experience that is a little cheesy, a little campy and a little terrifying. The line moves a little slow since they load the church every 10-12 minutes. The church does hold about 70 people which is a positive, but this is something you should hit earlier in the evening to avoid the long lines. During the press event they were having technical difficulties so the line was moving slower than it normally would. If they can keep all the technical aspects of the screening running smoothly, the lines should stay at a fairly maintainable length for the entire run. Overall this is a fun little addition to the event which we enjoyed very much although compared to the rest of the attractions at Horror Made Here, this was our least favorite. Still very enjoyable though. We were definitely excited about Nightmare on Camp Crystal Lake. Jason and Freddy, two iconic horror film villains together on the backlot to wreak havoc on unsuspecting guests. What could be better? You begin by hoping on a shuttle that seats about 11 people and are driven through a couple of dark streets on the backlot of Warner Bros. Studios. After a few short minutes you are dropped off at the edge of Camp Crystal Lake with a banner that welcomes you to the camp. As you pass under the banner and through an opening in the trees, you find yourself at the edge of the lake itself complete with a boat dock and some row boats. What happens next you’ll have to find out for yourselves but let’s just say this trip through the woods is dark, creepy, fun and sometimes terrifying. It is what the Terror Tram at Halloween Horror Nights should have been for the last several years. The only downside is how early the experience closes. We went for a 2nd time around 10:00pm and were told they had already closed the attraction for the night even though the map said the final shuttle left at 10:15pm. It was a preview night and sometimes there are little hiccups that need to be ironed out and 15 minutes doesn’t make that big of a difference, but moving forward, it would be nice to make sure the attraction closes when it says it will close since some people plan out their nights based on closing times of attractions. Having said that, this is a very good experience and should not be missed. Make sure to hop on a shuttle shortly after it opens to get an early trip through the camp. 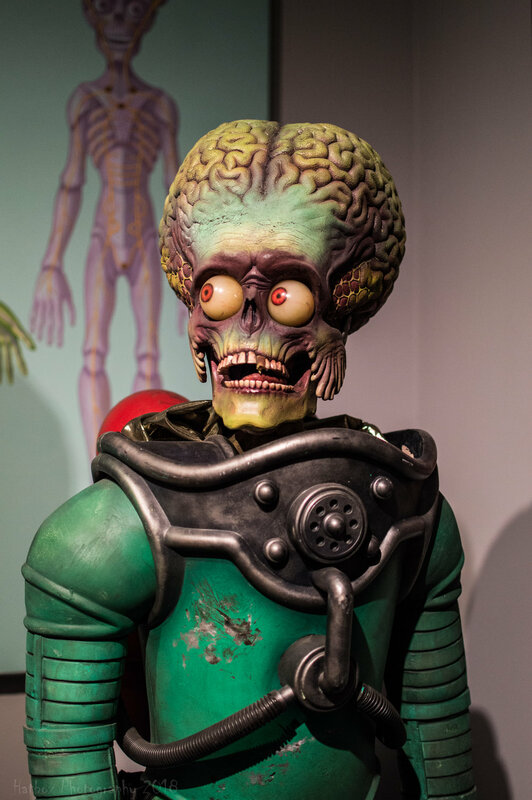 Behind the Screams at Stage 48: From Script to Scream is an exhibit that features authentic props and costumes from several of Warner Bros. more popular films including the Corpse Bride, Beetlejuice, Sweeney Todd, Mars Attacks, Batman Returns and several classic movies from the 30’s-60’s. This is a go at your own pace experience which also includes the actual Central Perk set used in Friend’s final episode. You can also take a photo while sitting on the couch from Central Perk. Towards the end you get to hold an actual Oscar which is pretty neat. There are two ways to get to this experience, you can either walk past the Conjuring maze and around the corner you enter the Stage 48 gift shop or when you return from Camp Crystal Lake, you are literally dropped off right outside the gift shop. If you have some time to kill and enjoy seeing history before your very eyes, we highly recommend taking a trip through Behind the Screams. This was a our very first year attending Horror Made Here and it made quite an impression on us. We will definitely be returning before the season is over. 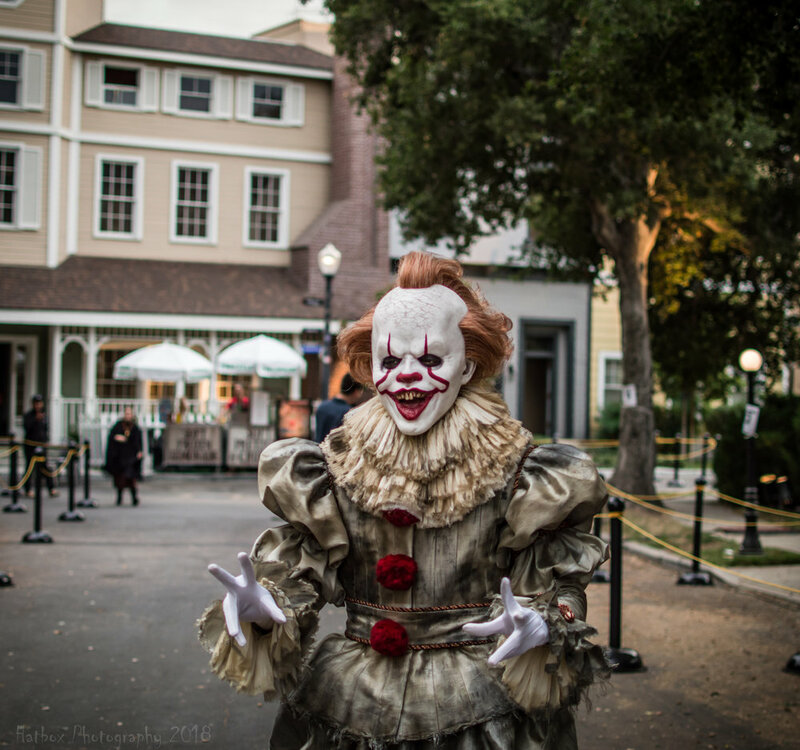 Even though this is only year two for the event (we don’t count the first year since there were no mazes that year) Warner Bros. is well on it’s way to becoming one of the premier Halloween events in Southern California. The mazes are incredibly detailed and well done, Camp Crystal Lake puts the Terror Tram to shame, the makeup is wonderful, the vibe is fun and upbeat and sometimes terrifying, the food is good and at a decent price and the crowd size is well controlled due to the limited tickets sold each night. Our only real complaint during the press event was the map said the event ran from 7pm-12am which was true however all 3 mazes closed at 11:00pm which was not listed anywhere on the map or schedule. We were surprised when we entered the queue for The Conjuring at 10:59 and were told the attraction had closed. We are not sure if this was just a preview night issue or if mazes will continue to close an hour before the actual event closes, but if this is going to be a nightly thing, it should be listed somewhere so guests are aware of this. We had stopped to eat around 10:30 but had we known the mazes would close at 11:00 but the food locations would remain open until midnight, we would have waited and eaten after everything else had closed. Other than that, this event was everything we could have hoped for. We highly recommend Horror Made Here for 2018. One of our favorite events we have experienced so far. Congratulations to Warner Bros. and the entire team at Horror Made Here. This event will be around for a very long time and we cannot wait to see what is to come in 2019.